The Quest for Consciousness: A Neurobiological Approach - Jon Lieff, M.D. 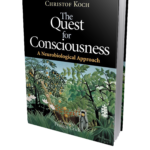 Professor Koch attempts to find the NCC, or the neural correlate of consciousness. He gives a very detailed, informative and well-written description of the visual system as it relates to issues of consciousness. He describes many regions of the brain relating to the search for the NCC. It is an excellent introduction to this entire area of neuroscience.